This badge would have been awarded to attendees of the National Association of Master Bakers (NAMB) annual dinner and who contributed generously to the National Association of Master Bakers, Confectioners & Caterers Benevolent Fund. 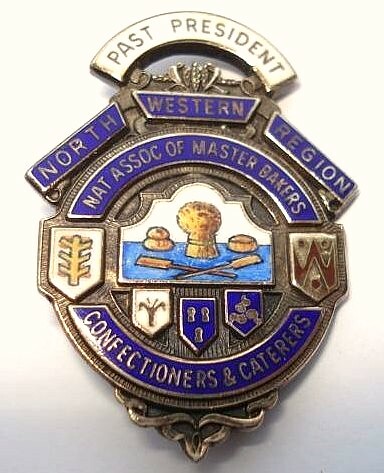 The NAMB was founded in 1887 and the issue of this badge would have coincided with their centenary celebrations. The NAMB changed their name to the Craft Bakers Association in 2013.
www.craftbakersassociation.co.uk/ (Craft Bakers’ Association website). www.bakeryinfo.co.uk/news/archivestory.php/aid/11519/NAMB... (NAMB to be called the Craft Bakers Association). Enamels: 5 (dark blue, light blue, red, yellow & white). Imprint: Silver hallmarked for Birmingham 1987 (N). Maker’s mark T.F for Thomas Fattorini Ltd.
For sale on eBay by themintedone. £45 ‘buy it now’ + p&p.